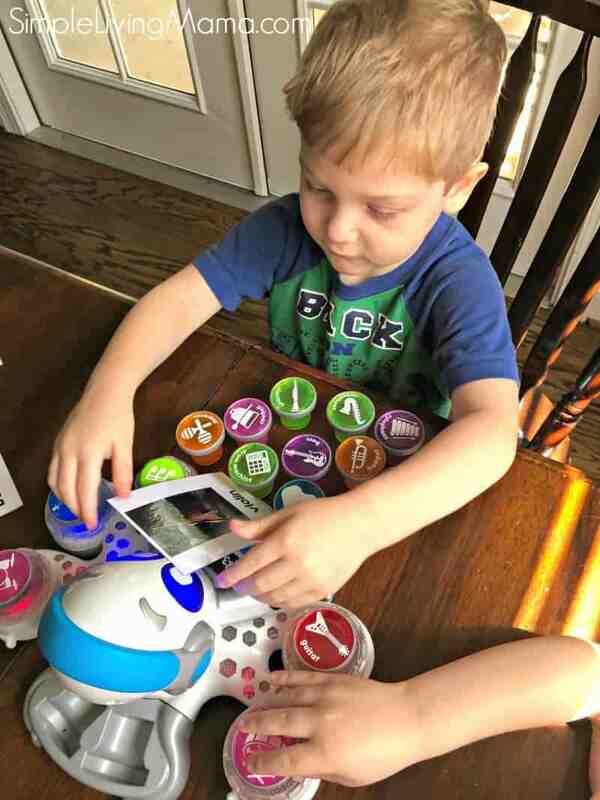 I can’t say we are the most musically inclined family, but with my love for a Charlotte Mason education, I have felt it important to introduce music to my children. 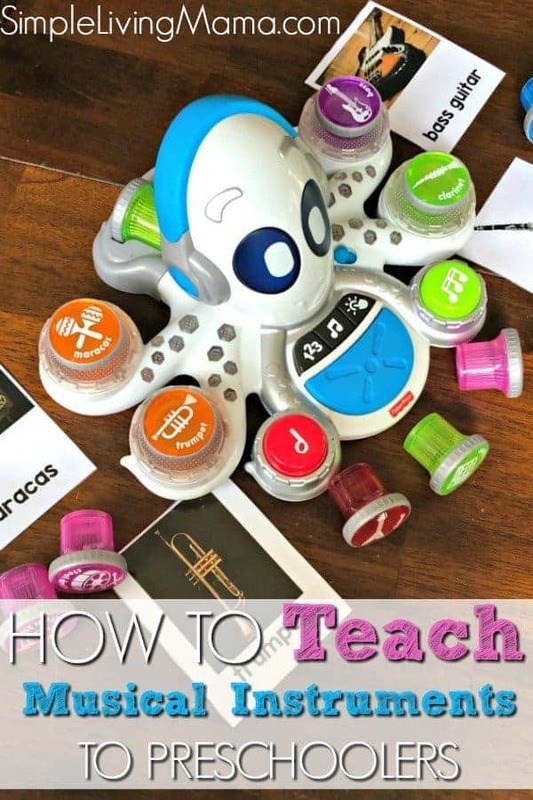 Today I want to talk about how to teach preschoolers musical instruments. 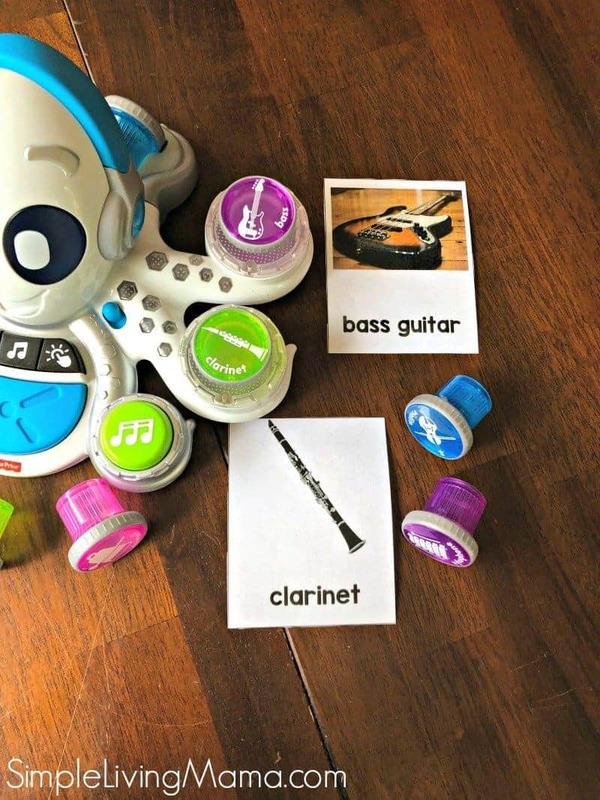 This idea is all about introducing different instruments to your preschooler in a fun and interactive way! 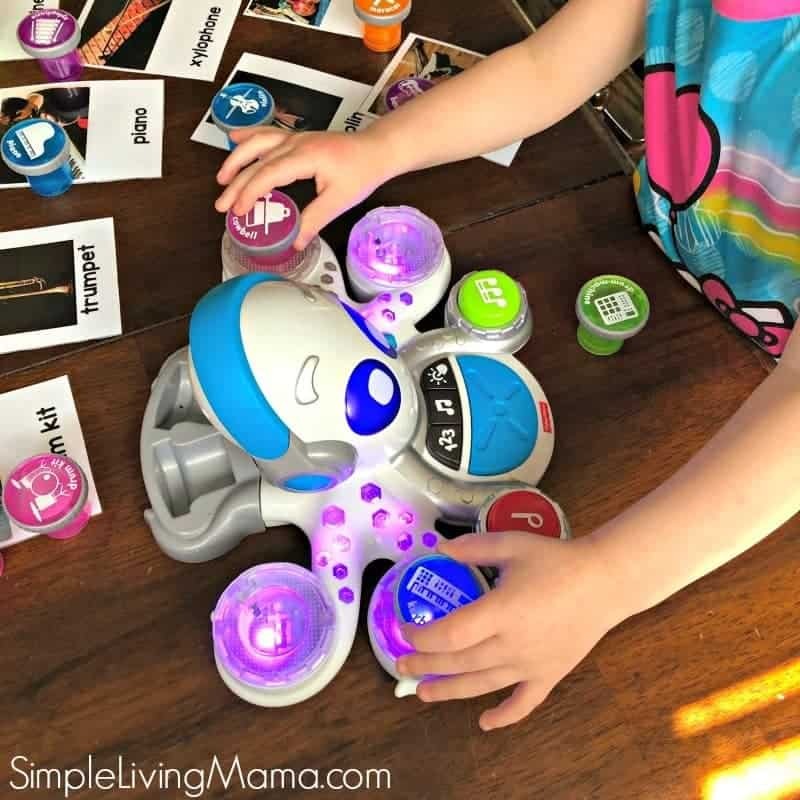 When I’m shopping for toys for my kids, I want to get them things that are both fun and educational. I am a homeschool mom, after all. One area that I knew we had not covered much in our homeschool was music. 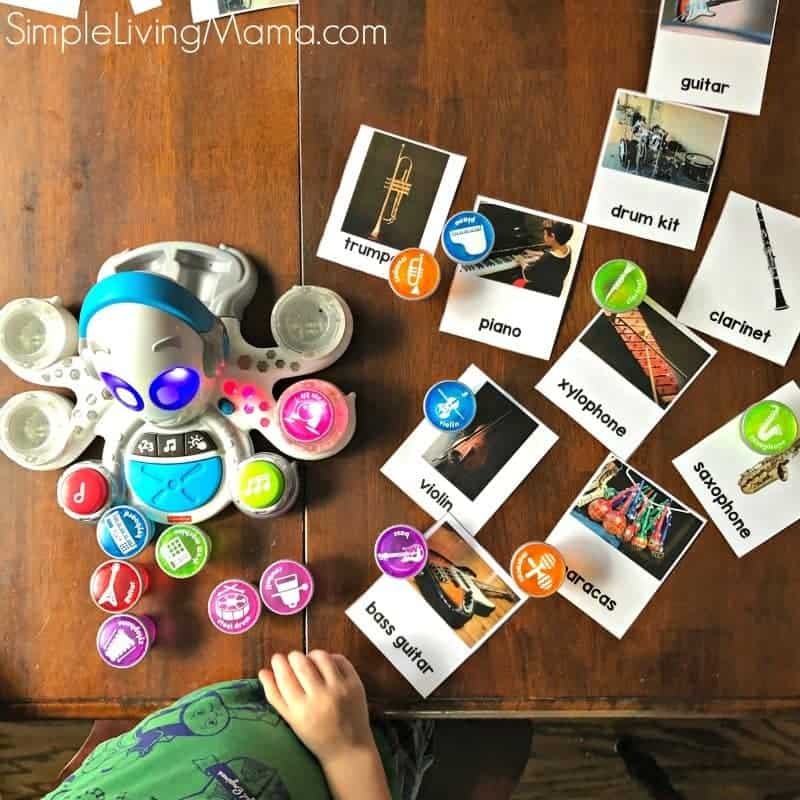 My kids like music well enough and I try to make sure we listen to classical music, but I knew they weren’t familiar with many musical instruments and their sounds. 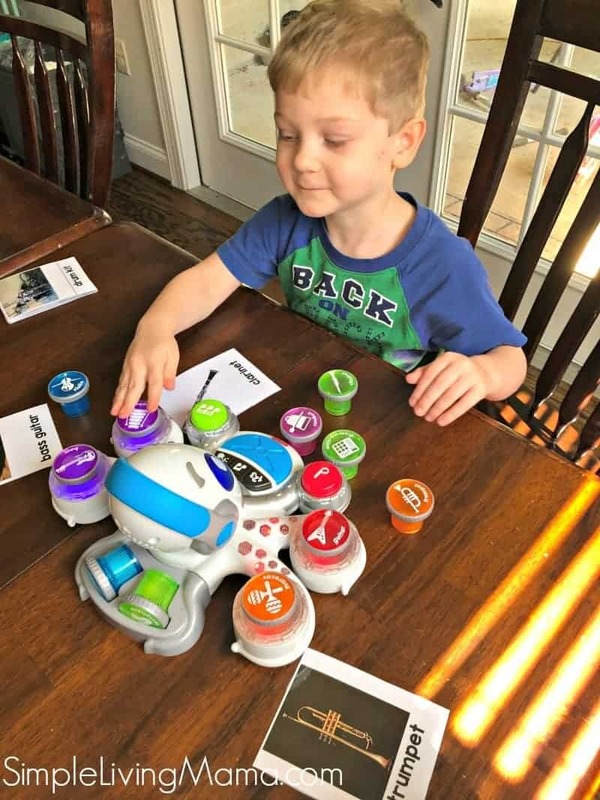 We were given the opportunity to try out the Think and Learn Rocktopus™ from Fisher Price, and I was over the moon ecstatic about it because it provides such an amazing educational opportunity for my preschoolers! 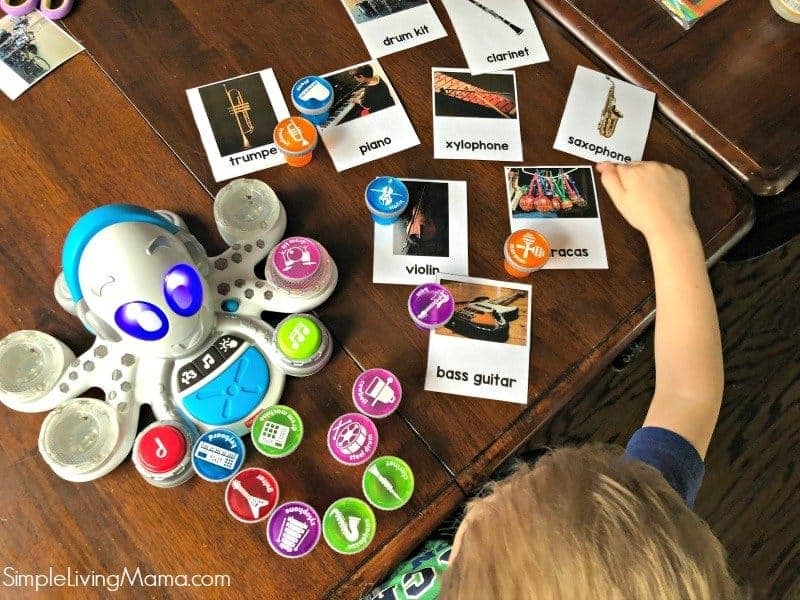 The Rocktopus introduces 15 different musical instruments and their sounds. I knew we could learn so much just from that. Not only were we introduced to the musical instruments, but also interesting facts about them. Another function that I loved was the math function. 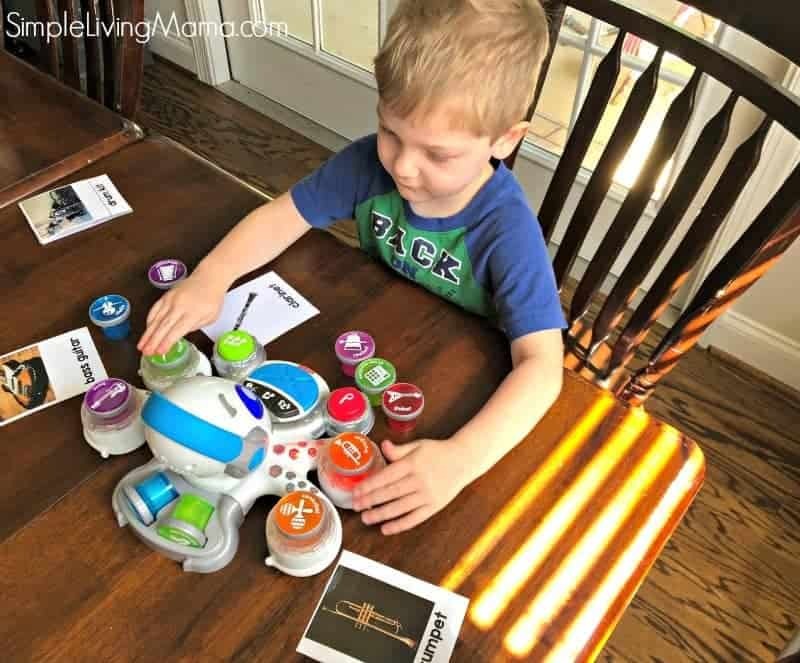 The Rocktopus introduces basic math concepts by having kids add or subtract instruments. Isaac, my three year old, loved the game mode. He was so excited every time he reached a new level! 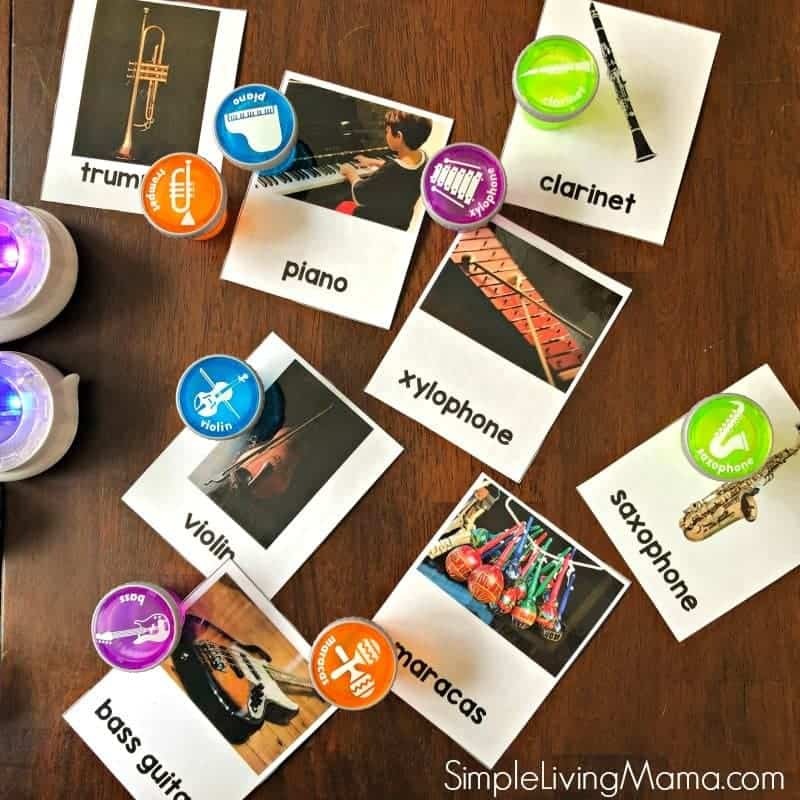 To teach my preschoolers the different musical instruments, I created 10 musical instrument flashcards. Isaac was able to match each instrument to real life pictures of that instrument. He really enjoyed learning the names of the instruments. He was then able to insert that instrument into the Rocktopus to hear what it sounds like. Never would I have been able to introduce so many different instruments in such a fun way that my preschoolers would actually respond to! The musical instrument flashcards you see above are actually musical instrument three part cards. I’ve been adding some Montessori elements to our homeschool preschool and have really found them to enhance the kids’ learning and to help them retain information. For now we are just using the whole cards to match to musical instruments. 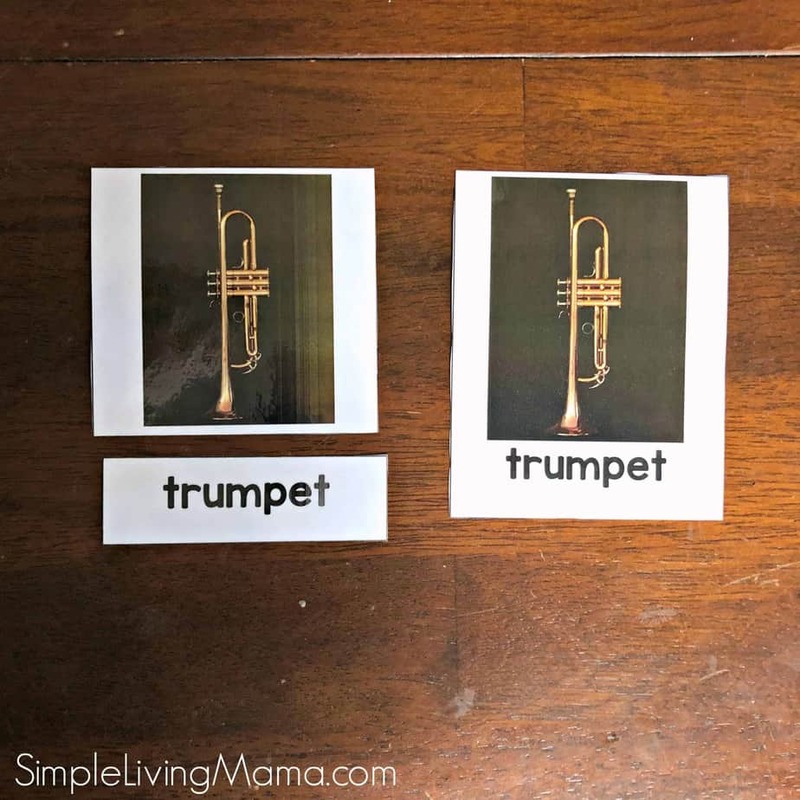 These cards are great for helping the kids learn the real look of the instruments and the written word. 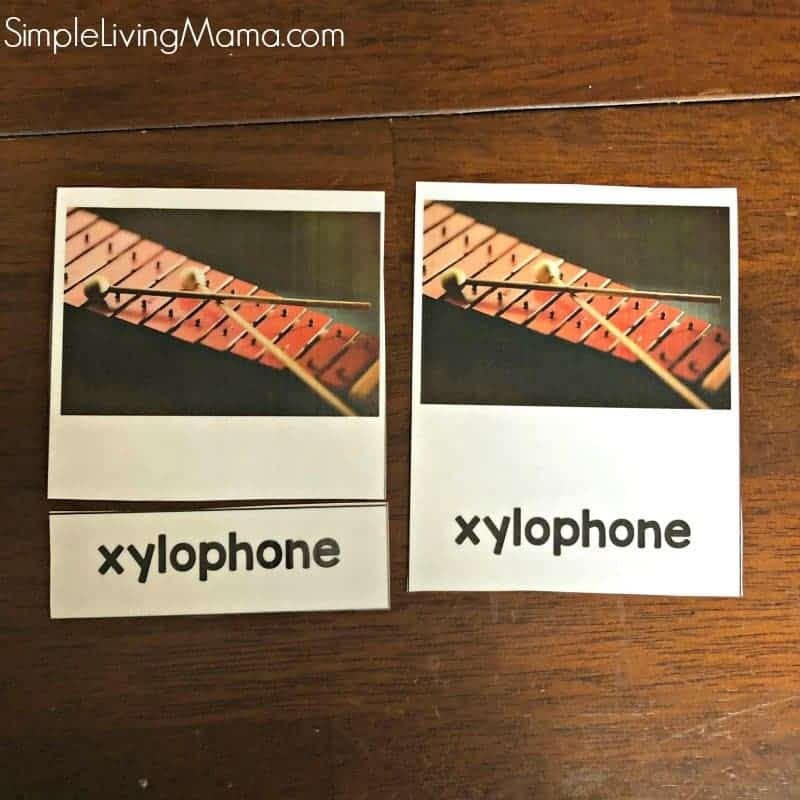 Eventually we will add in the two part cards so the kids can match the words to the pictures, too! If you’d like to snag my Musical Instruments Three Part Cards, hop on over to my shop! 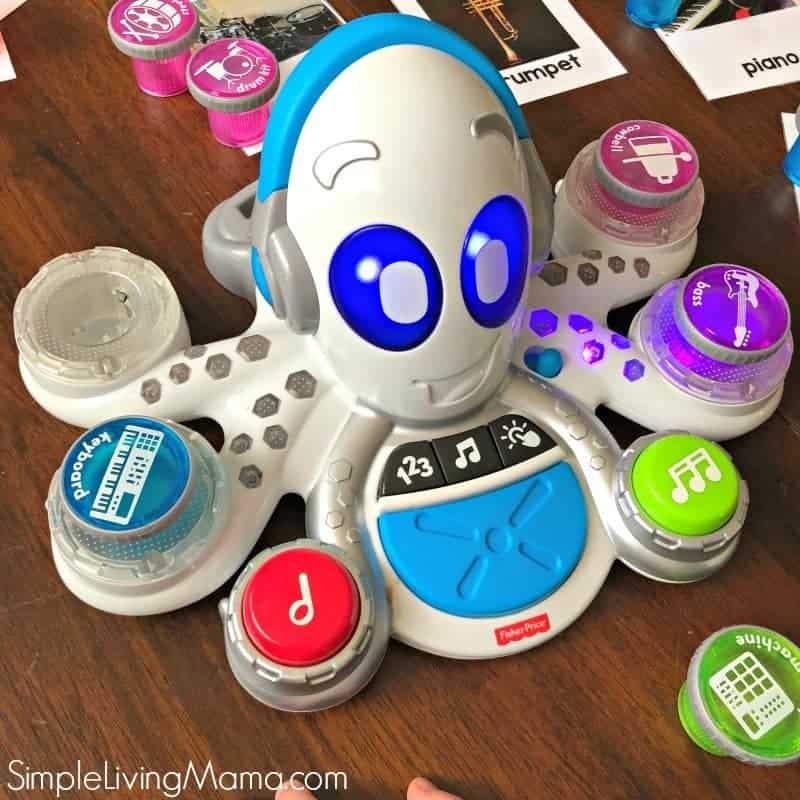 You’ll definitely want to bring home the Think and Learn Rocktopus™ from Walmart for your kids. It would make an amazing Christmas gift!